remove extra target from any single target action queue manipulators. 1) make snowstorm identical to judgement and make them single cast only, even if caster has multicast. 2) keep them but add a significant penalty, like -50% max hp or silence/scorn your party, or remove party traits or artifacts, etc. artifacts and rare mats: not sure if how it's currently working is intended given it's a pretty big difference but i'd limit artifacts to 1 of each rare mat for spell slot, +/- class damage, and start with X. however i'd like to see % on hit or % when hit be able to have multiples, maybe 2-5. there's a fair number of creatures that do extra damage based on enemy debuffs and dots present and i like the idea of a few fast hitters that can proc multiples. as for war forged, remove invis from the share and that should be fine. this makes sense as you have the whispering shade who has the party invis trait, that whole family is focused on invis. i think shell should be shareable for now, if players still want to then combine war forged + pariah + stifle that's 1/4 of a party's traits which may or may not be enough of a handicap. shell can always be revisited. Maybe include the clause except shell and invisible if you want to limit its power. I haven't been able to do so since 0.0.1. Weird. I was heavily using an artifact that had grace and mend in my early game. I tested with all the heirlooms, and you're right. Since I had previously find such an item, I just assumed that I could make one myself at the enchanter. My apologies for drafting us down this tangent. The only real problem is spells, which work with action queu, coz today i obtain infinite turns without gems with 0 MP, im just combine Arcane regen + some traits + frozen debuff + haste (MP cost) and snowstorm (MP cost). There a lot of content in the game and dev have a lot of work with bugs, so the best way is just REMOVE few spells (snowstorm, haste, rabid etc.) from the game until dev find time to solve this problem. and nerf plz Zealot occultist.. 30% INT buff... sometimes after few turns i see 8 000 000 dmg from burn or +2 456 345 INT after casting another "haste". p.s. also, im sure, any other changes, other than total ban this spells is useless, coz until we can work with action queu, we can have infinite turns. and any changes is just a waste of dev's time. If that's intended, then it greatly diminishes War Forged. The key combo with it then is using both Shell and Invisibility across all creatures simultaneously. Remove that, and War Forge is still powerful, but it isn't the guarantee like it is now. That's a new bug then, Umaro. You were able to previously apply Starts With... 10x to your artifacts if you so desired. These need to be buffed. Most of the books are useless compared to normal spell gems. You can get close to the same thing with certain spell gems but they just take a spell slot and not a trait slot. Each creature can have a max of 2 traits(nethers excluded) and can have up 8 spell gems. (Creature spell gem buff and the artifact 2+ spell gem slot) The flavor on these books is awesome and I really want to use one on my team but I can't justify using one because it just seems like a waste of space now. Agree. I was highly disappointed with the grimoire traits I've uncovered. One cool trait I think would be making some disarm spell. You cast it on all 6 enemies and you give them all scorn and you have a 50%-100% chance to take away their artifact. (Lose all stats/traits/anything given by it, make there be no counter to this). It's already in the game, FYI. You can cast Scorn now, and use the Nuy rune. It doesn't remove the artifact, but it removes the all-important traits. But artifacts ARE limited to 1 heirloom already. They aren't, you're thinking of traits. You can have an artifact with 10 heirlooms. It's not really that you can use more than 1 heirloom in the artifact, it becomes an issue when you can use War Forged to gain 6x that benefit. Having 60-80 more artifact slots free due to a single trait is what is wrong. War forged is a good one, I'm not sure how to change it without making it useless but something has to give, as Umaro said it's basically god mode. I run this and the combo of shell/protect/invis basically makes you guaranteed to have a turn even if enemies are thousands of levels above you as long as you have a way to stop them from casting aoe spells. I haven't fully thought this through, but would it perhaps be helpful to limit the number of Blue (2nd Tier) properties on an artifact? Clearly, stacking lots of Heirloom (start with buffs) is strong and makes it difficult to balance certain traits. 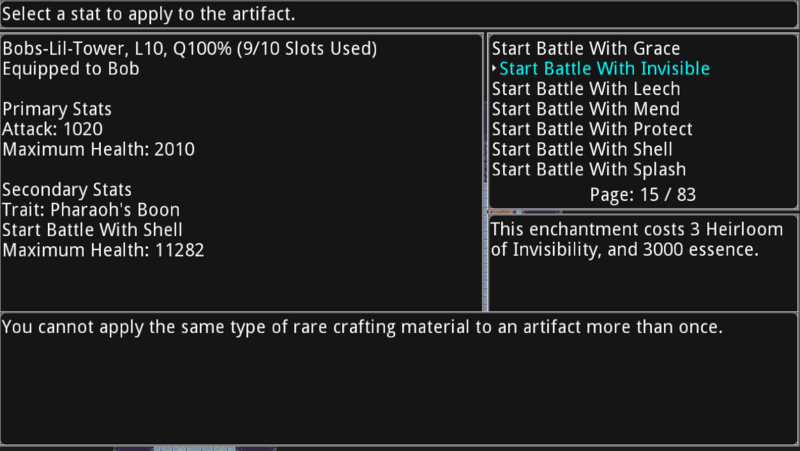 What happens if an artifact is limited to 3 Blue (2nd Tier) properties? (Or even 2???) ... and the rest can only be basic stats? I think a lot of traits need to be balanced and it will add more variety in the game. This trait needs to not stack. Lots of the builds early on abused this trait/Cerberus running sometimes up to 5 of them just because of how insane the stacking works. It was nerfed from 15% down to 5% which was need but it's not enough. I think it should be changed to be somewhere around 10% but does not stack, this would make it still a viable trait but not OP. It would be comparable to pharaoh's boon then but only for one stat and also has the drawback of that creature can't cast spells in exchange for not being forced to have only one class. Maybe add a super unique effect for a 4th spell to each, they need something cool about them. I really want these to be good because I just love their flavor and sprites. One thing I think is the creatures' mana pool should be higher. I say give them 20 more mana, this would be the highest in the game to my knowledge by about 20 mana. That would make the trait better, you get these 3/4 spells and 20 extra mana so they can cast more. I'm at work now but I'll make another post later with more ideas and hopefully some solutions. It would be much easier to write when I can see the in-game stuff. I agree with some of the changes to spell gems; they do feel more like a random chance to obtain rather than something you work towards. It might be cool to have them behave somewhat similar to artifacts, in that they start off with 0 traits, and then after being equipped and getting X kills (eg: 10,250,1000) they gain a random trait. Or have a power unlocked by the gods that allows you to begin a ritual to upgrade/change a spell gem. As for the balance changes to spell gems, there definitely needs to be some changes to hard disables. To me hard disables are any disable that is a 100% chance of missing a turn. These are things like Stun (preventing all actions on your turn) or Snowstorm/Judgement, which effectively skip your turn by making every creature go before you. These abilities have no or very little counterplay (I think stun has a rune to lessen the effects), and it shouldn't be possible to apply these effects to an entire team with a single turn. It might make sense for Secret Ingredient to be immune to all spells, not just enemies. That way the only buffs they get are from traits/Artifacts, they can't be buffed to infinity, can't be healed by allies, but still retain the jist of the trait in that they guarantee at least 5 hits to die. It seems generally too easy to get incredibly powerful spell gems, particularly early in the game. Getting exactly the spell gem you want with the properties you want should be something you have to work towards over time. Getting many small upgrades to your spell gems -- instead of finding a near-perfect gem early-game -- results in a smoother power progression as one plays the game. (E.g., getting an AOE spell early game with Casts Twice, Extra Damage and Costs Health can be quite disruptive to the early-game experience by trivializing content and allowing new players to progress rapidly without learning key tactical elements of the game. )I echo this. Chaos especially gets off to an incredible early start because not only does it have a massive beef of a creature (Berserker Fiend), but also it's spells are insanely powerful. A fiend equipped with Panic Attack, Aftermath (and this one is guaranteed to be acquired), or the other one that attacks creatures combined with cast-on hit allow that creature to one-shot entire packs due to berserk scaling. It's also a FAST creature, so it almost always goes first early on. I think a good solution is to have the extra spell gem traits unlocked via god reputation or even an additional NPC. This would also mean the initial starting complement of 5-6 gems all come traitless. Under this solution, it takes time to acquire the rep, and only then do you start uncovering gems with incredible power like -mana cost%, cast twice, or hp%. Another solution is to have each mage class perks surrounding the gems. Anything off-class doesn't get the benefits. But I echo the general idea that directly out-of-the-gate power is pretty random. Get something decent? You'll wreck face for 100 levels. Get something weaksauce? Well, you'll spend more time grinding. This post contains feedback about spell gems. Umaro is absolutely correct that "Casts on Additional Target" Haste (or Rapid Dementia) is a serious problem, as are Snowstorm and Judgement. Additionally, with regards to action queue manipulation, note that putting an enemy in a random position in the action queue is a lot less dangerous than pushing the enemy to the bottom of the action queue. It is possible that one issue is that too many of the properties are powerhouse such as Casts Twice and Costs Health (though as per Umaro Costs Health likely needs to be weakened overall). It might be helpful to dilute the pool of possible spell gem properties with a few more situational properties like "Bonus damage to Sorcery" or "Targets an extra Sorcery Creature" (which would be weaker than "Bonus Damage" or "Extra Target" but could have less of a mana cost impact). Similarly, the range of values on Bonus damage may be too narrow. For example, I believe it is not currently possible to roll +20% Bonus damage. Getting 20% more damage on a spell isn't dramatic, but it is definitely useful (and noticeable). Additionally, if I have seen a large number of gems with bonuses in the 20%-35% range, that makes finding the gem with +50% bonus damage feel really exciting. Therefore, I think you should consider widening the range of possible bonus damage values (in both directions, make the high end higher as well) with a distribution such that values in the lower part of the range are significantly more likely to be rolled. Finally, it currently seems that gems with three properties appear too often, particularly early-game. Three property gems are much more likely to be powerful than two-property gems. (In part, because they can roll one "junk" property and still have room for whatever incredible two-property combination you are looking for.) Personally, I think that three-property gems are so powerful early-game that you should consider having the third property slot on a gem be something that needs to be explicitly unlocked through play. (For example, early game all gems have Zero to Two properties and then you get an "extra property on all spell gems" unlock at some point that causes gems to have One to Three properties.) Even if you don't do anything that extreme, I would suggest that you alter the distribution on the number of properties so that getting the maximal number of properties on a spell gem is more rare than it is currently. Bottom Line: Spell gems are awesome and the game is fun when magic is powerful. However, I am concerned that currently the power of Magic is a bit too front-loaded because of the ease of obtaining incredibly strong gems. Note that the harder one has to work to obtain a near-perfect spell gem, the more powerful that near-perfect spell gem can reasonably be. I would like to see a scenario where early game I find a lot of spells with either no property or one fairly tame property like "20% Bonus Damage" or "Reduced Mana Cost". This allows a new player to get to know the spells in the game and find spells that work well for the player's team. If you find enough fairly basic gems like this, then the moment you get a spell gem with "Casts Twice" + "60% Stat +/-" it feels incredibly strong and immediately gets the player thinking "How can I adjust my strategy to make use of this awesome gem". Ultimately, I want spell-casting to be powerful, and the goal is NOT to say "nerf spellcasting". Instead, I would like to see a smoother progression in the power of spell gems. Indeed, making good gems harder to the find may enable flat buffs to basic spell-casting numbers/mechanics because the system would no longer need to be balanced around players having essentially perfect gems by the time they reach Misery.